Singapore was going to be my hub for my next destination as I had Changi International included in my miles and more around the world ticket. Look to mainly include long distance flights here. To get to Hong Kong I purchased another short distance flight through Jetstar. Budget airlines like Jetstar are the cheapest way to get around in South-East Asia and Australia. I used Jetstar all the time and always got the flex-fare for around 5$ more which allows you to change dates etc. Booking 1 week ahead mostly worked out fine. A goodie: for each completed flight Jetstar gives you 15$ vouchers that you can use on your next flight booking. Hong Kong airport is well organized and you can easily take the train to the city for just 12€. An advantage on the way back, you can already check in your luggage at the city center train station. I had just perfectly positioned my backpack on my back that I didn’t even take it off for the entire ride that is like 30 min. In Hong Kong, I was going to stay with a Chinese friend I had met during my exchange semester in Copenhagen. He lived with 2 other flatmates right in the center of Hong Kong directly next to all the tall as financial district buildings. Their place even had a rooftop terrace. Sweet Hong Kong, that’s the kind of welcome I like. Finding my friend turned out to be quite the hassle since I couldn’t find my way around the city in the beginning at all. The whole city is a network of second-level bridges like in a Star Wars movie. At the end of my time I was a pro but in that moment I was just lost. We finally managed to find each other and I was surprised how tall my friend was – I didn’t remember him like that. Having been to Beijing before people in Hong Kong seemed way taller than the average Chinese. Each morning the same funny situation would repeat itself. My friend’s flat was in a small street with a lot of local restaurants and the tiny entrance was kind of hidden. So as the day started at some point this blonde tall European would miraculously appear and all Chinese would look shocked about that sudden appearance. That was really cute. First, I checked out Soho and LANG KWAI FONG which was really close to where I lived. A sweet not very obvious restaurant with the best dumplings is ‘Wang FU’ on 65 Wellington St. Close-by you will also find a very trendy juice café called ‘Catch Juicery’, they had just opened when I was there and have expanded ever since. If you’re up for a snack in-between check out ‘Munchies’ they have got very original organic cookies and ice cream. Lan Kwai Fong is a lot of fun with a lot of bars and pubs but also traditional street food corners or more western design and art shops. PMQ is a big art square which is a must see since it’s a whole building of local and international artists selling unique clothes and all other kinds of cute products. The area will keep you busy for a whole day and you can finish off with a tasty dinner either local style at ‘Café Hunan’ at 68-70 Lockhart Rd where they serve traditional food from the province Hunan in China or you enjoy awesome dim sum at ‘Dim Sum Square’ at 88 Jervois Street. Hong Kong can easily be discovered by foot. I prefer simply starting to walk and just see where it takes me anyway. Hong Kong is such a vibrant and diverse international place and I loved all about it right away. I have to say I did not expect it to be so hilly though. The Golden Bauhinia Square or Hong Kong Park with the pretty botanical gardens are all within walking distance from the city center. It’s incredible how skyscrapers merge into flower gardens in this city. A must do is hiking up ‘The Peak’. I did it so many times it’s a good workout in the morning, a fun activity for the afternoon and a perfect finish-off to watch the Hong Kong skyline by night. Trust me, it’s steep as hell…Well, I have been to the world’s steepest street in New Zealand, it’s almost comparable to that. Another fun activity will be taking the ferry from the harbor area to MONG KOK & KOWLOON and spending the day there walking down Shanghai Street and exploring the Yuen Po Street Bird Garden. I met a parrot here that sang happy birthday with me which later ended up being the birthday present for my dad. Close-by is also the Flower Market and Goldfish Market which are definitely worth the experience. Definitely stay over at Kowloon until it’s dark so you will have a perfect view from the Kowloon Riverside to the Hong Kong side. 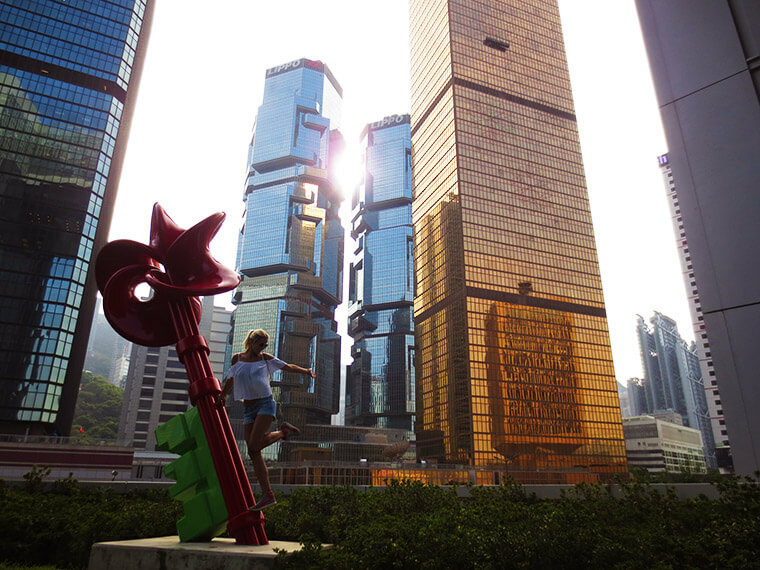 Visiting one of the islands is also a great way to explore Hong Kong and its surroundings. I took the ferry for 1 hour for 2€ to CHENG CHAU. Once you get to the island just start walking and follow the trails and see where they take you. On your way eat as much awesome food as you can. I can recommend egg waffles with red bean paste filling or Mochis with mango filling. You will get a perfect ocean view and feel like you’re at the end of the world. You can also climb through caves (Not my favorite, I hate tiny spaces!). Also, expect to see the most beautiful graveyard right at the cliffs facing the ocean. 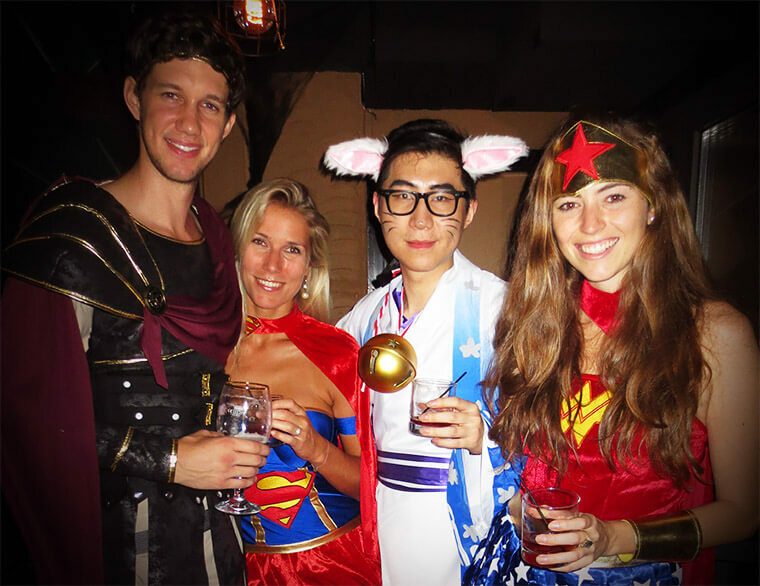 Last but not least, if you can make it happen, visit Hong Kong over HALLOWEEN – it’s quite the experience. It’s said to be the most famous place to celebrate Halloween besides the States. You can easily purchase a costume last minute in the ‘Halloween Street’ (Pottinger Street) at Lang Kwai Fong which reminds one of Diagon Alley in Harry Potter. Lang Kwai Fong is crazy on Halloween. Police Officers are handling the crowds by setting up roadblocks. Everyone is out on the streets until late in the night – it’s one big open-air party. You can also buy a ticket for one of the clubs but that is usually very expensive. We decided to get beer from 7/11 and just dance our way through the streets instead. Keep in mind, cocktails and drinks in bars are expensive as. We allowed ourselves one fancy cocktail that night which was probably like 24€ – it’s crazy! My final rating for Halloween in Hong Kong though will be a perfect 10. Staying with my friend and his flatmates was such a unique experience. From day 1 I felt like a part of the city. I was really grateful for this opportunity. Having to leave again we were all really sad as I had kind of become like a 4th flatmate. We were all feeling really weird about my departure. Hong Kong triggered that I started thinking about living abroad for real. I could have stayed here right away and would have been so happy about it. This city really took me by surprise. After the Maldives, I was actually lecturing myself how stupid I was to start off my trip with one of the most beautiful places on earth. And I was wondering if any other place could beat it. Hong Kong though showed me its own magic and I just loved the city.